Like a good story, every project has a beginning, a middle, and an ending. And just like in stories, a project can either have a happy end or end in a tragedy, depending on how it was managed. Every project manager - no matter if you’re new to the profession or an experienced professional - needs to understand the project life cycle to complete projects successfully. The project life cycle can help project managers and their teams to focus on meeting the project’s objective and delivering it on time and within budget. 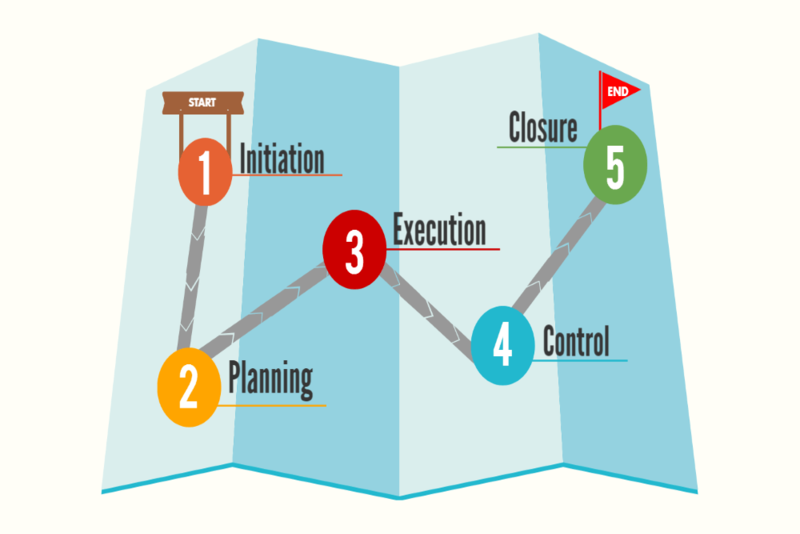 The project lifecycle contains 5 phases through which every project has to go: Initiation, Planning, Execution, Control/Monitoring, and Closure. The first step of every project is to identify the project objective. The overall goal is always to add business value, but each project has its own goals (solving a problem or gaining an opportunity). The PM selects team members with the necessary skills and experience to contribute to the project. Determine whether the measures you have identified to reach the project objective are feasible. Questions you should ask are: "Can we do the project?" and "Should we do it?". Determine the deliverables of the project and present the strategy to achieve the project objectives to your client or customer and get their approval ("acceptance"). This serves as a baseline that will later help you determine whether the project is on track. Risks can derail your project schedule and cause additional costs. Identify all possible risks and establish a strategy to either prevent them from occurring at all, or to mitigate their impact on the project. Determine the project's task and resource requirements (scope). Break down your project into manageable tasks, and allocate them to the appropriate resource. Create a task and time schedule that is as accurate as possible and includes dependencies, milestones and critical paths. Estimate the project's costs and create a project budget based on these estimations. Having an accurate schedule and resource plan will help you estimate costs more accurately. It's important to continually compare estimated costs with the real costs to avoid overrunning your budget. Identify and analyze your project stakeholders and establish a clear communication process to keep your team and stakeholders informed. Determine the communication channels and frequency of status updates and review meetings. The project manager and team put the project plan into motion. While doing so, it's essential to always keep the project's objective in mind and to continually compare the actual progress with what was planned. Deadline and milestones keep the team on track. Have regular status and sprint meetings to make sure that the team produces deliverables on time. Have procedures to identify issues and delays immediately so that you can deal with them in a timely manner. Assess the efficiency of your processes and improve them if necessary. Monitor the progress of the project and make sure that the project stays on the right course. Having a change management process in place will help you control your project and avoid unnecessary changes that can cause scope creeps. Track the project's performance and assess whether it aligns with the project's objectives. Is the project on schedule? Is it still within budget? All project deliverables must fulfil certain quality standards to meet the client's requirements. Assess each deliverable in status and review meetings and determine whether it meets the requirements. Present a formal project review report to the client or customer and get their acceptance of the presented deliverables. Make sure that the client is satisfied with the end product or whether they require you to make improvements here and there. After every project, it's important to conduct a "lessons learned" analysis. Get feedback from your team and the client/customer. Assess what went well and what didn't and use this empirical information to improve the efficiency and effectiveness of future projects. Back to Basics (Part 6): The Project Management Life Cycle Model – A Roadmap to Success - InLoox • Copyright 1999-2019 © InLoox, Inc. All rights reserved.